The hip DIY project looks cool and costs less — but is no simple task. In a secluded corner of Joshua Tree, California, a livestock tank painted white, surrounded with cactuses and crowned with black string lights serves as an outdoor tub for an ultrahip Airbnb. 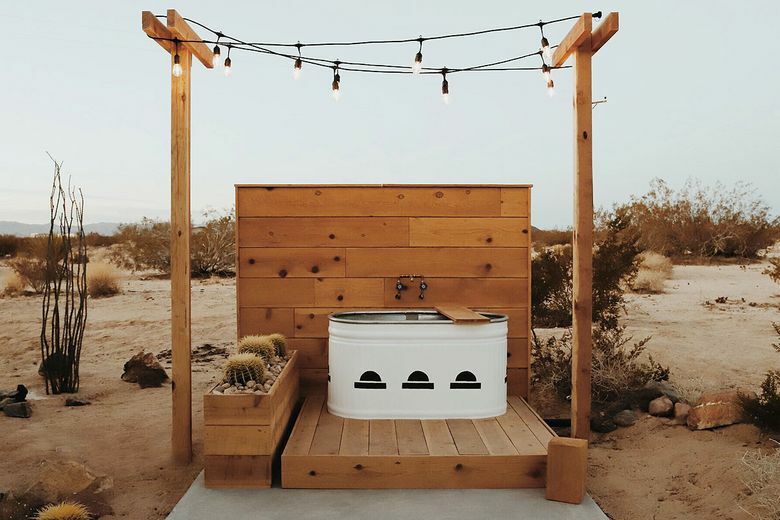 The tub was dreamed up by “The Shack Attack” home’s owners Kathrin and Brian Smirke as a respite from the desert elements, and quickly took on new life as an Instagram photo booth of sorts, where guests are all too eager to pose for a mid-soak snap. 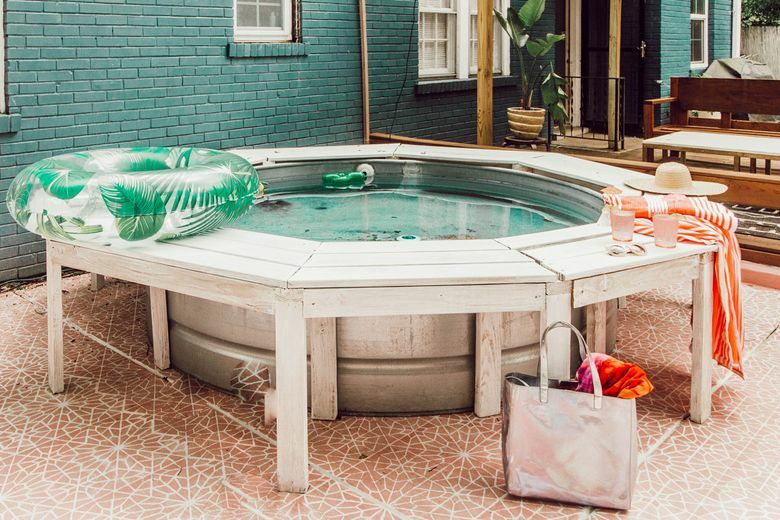 Last year, New York magazine’s the Strategist dubbed stock tanks “the Mason jars of backyard pools.” But unlike Mason jars, this resurging throwback shows no sign of losing steam. Murtaugh saw the trend take off last spring after Country Living picked up a stock-tank pool tutorial from retail chain Tractor Supply Co. But is rigging up your own outdoor oasis really a good idea? Although DIY shipping-container and pallet pools aren’t exactly practical, Kraisinger says that, executed correctly, stock-tank pools achieve a certain design aesthetic for a fraction of the cost of an in-ground pool. But once you start adding custom features such as pumps, filters and lighting, look to a professional to ensure everything is up to code, says Kraisinger, who after 25 years in the business has seen his fair share of DIY disasters. “It ends up costing three times as much as if they would have asked a professional from the start,” he warns. Nashville bloggers Casey Freeman and Savannah McNeill of the blog Hey Wanderer fell for the look of stock-tank pools after seeing them on Instagram and Pinterest, but it took a few rounds of trial and error and plenty of elbow grease to achieve their perfect backyard setup. McNeill added an aboveground pool pump and filtration system she purchased at a hardware store and documented her step-by-step process in a YouTube tutorial. She estimates the project cost about $500 — they purchased the stock tank from a local co-op for $350 and spent about $100 on the pump. McNeill, who has since built a custom bench seat around the perimeter of the pool — which they call a “game changer” — says the project definitely requires someone with a DIY mentality. Ultimately, Freeman and McNeill say, the eight-foot-diameter pool has been worth the sweat equity and never fails to impress house guests. “People lose their mind when they see it,” Freeman says. 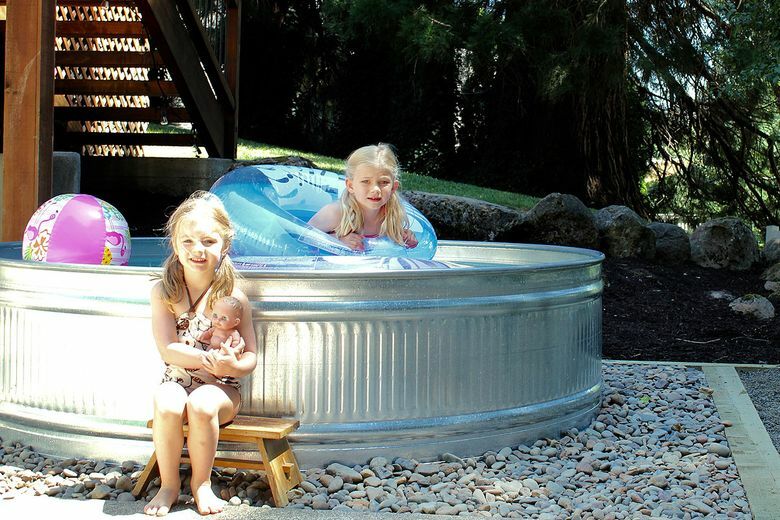 Darci Haney of MD Haney & Co., an Oregon-based home design and remodeling company she runs with her husband, says she, too, found a picture of a stock-tank pool online when looking for an affordable pool option for her two young daughters and quickly became a convert. Now in their second summer with their 8-foot-diameter stock-tank pool, Haney says it’s big enough for her children, ages 5 and 7, to float in inner tubes and strong enough for them to hold onto the sides and kick their feet. Her husband, an experienced contractor, had no trouble leveling the pool with sand and surrounding it with river rock so the girls wouldn’t track in grass. Other kid-friendly additions include a solar heater, custom cover and sand filter pump, as an alternative to harsh chemicals.